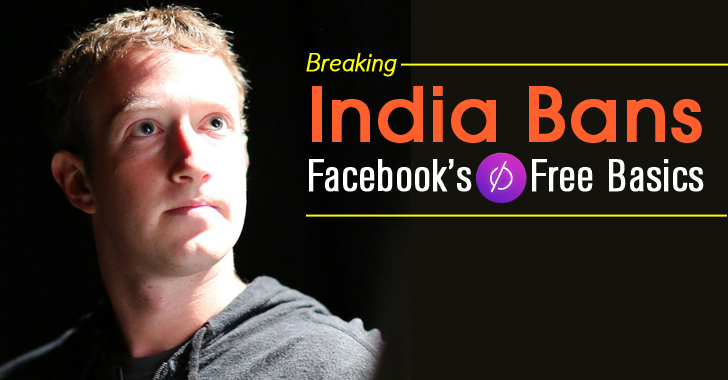 Facebook's Free Basics Internet service has been Blocked in India. The Telecom Regulatory Authority of India (TRAI) has banned mobile carriers and broadband providers to charge customers based on what services or content they access over the Internet. Under Prohibition of Discriminatory Tariffs for Data Services Regulations, 2016, "no service provider shall offer or charge discriminatory tariffs for data services on the basis of content." With this, Facebook's Free Basics is dead in India. All Zero-Rated Internet Services are BLOCKED! It is not just Facebook's Free Basics Internet program that has been blocked inside the country, but also the zero-rated internet services altogether. Zero-rated internet services means those services that allow people access to some websites and web services without utilizing any of their mobile data allowance. Under the new regulation, no such services are now allowed. Free Basics (previously known by Internet.org) is a Facebook's service that offers people access to more than three dozen Web services hosted on its platform at free of cost. Subscribers of Free Basics app must have a Reliance mobile network on their phone and are limited to a range of portals including Wikipedia, BBC News, AccuWeather, Bing, and various health websites, and of course, Facebook and Facebook Messenger. Since its launch, Free Basics has been a controversial subject in the country and violated Net Neutrality principles. Net Neutrality advocates argued that by offering some websites and services for free, people are discouraged from visiting other sites. Facebook's Free Basics offers a huge advantage to the sites and services it includes. For example, if the Free Basics includes Facebook Messenger to access for free, any other instant messaging app wouldn't be able to upsurge in this competitive market, and this is nothing but the violation of Net Neutrality. The Telecom regulator had previously ordered Reliance Communications to temporary suspend Free Basics until the regulatory had come to a decision regarding the implementation of rules on differential data tariffs. Facebook has been contacted for comment on the new regulation in India, which is the second populous country in the world. We'll update this article when we hear Facebook's response.